4 Bedroom House To Rent in Loughborough for £995 per Calendar Month. 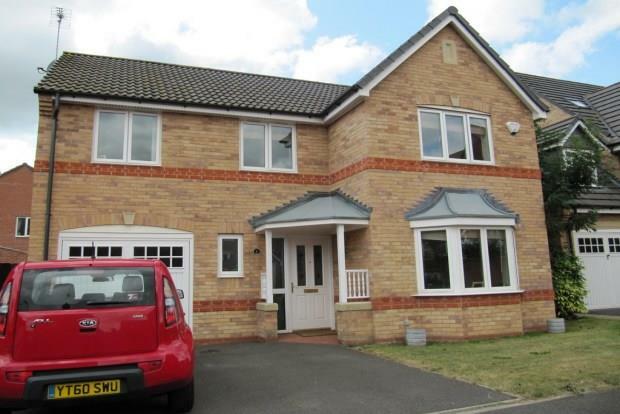 Modern 4 bedroom detached property located on the sought after Fairmeadows estate. Early viewing is strongly recommended. Benefits include GCH, DG, garage, driveway, gardens, ensuite to master bedroom, unfurnished. The property briefly comprises entrance hallway, cloaks wc, lounge with living flame gas fire in adams surround, doors leading onto the dining room with patio doors onto the rear garden. Breakfast kitchen with a range of wall & base units with gas hob, electric oven, fridge, dishwasher, utility room with access to the garden and garage. First floor with master double bedroom with ensuite shower, wc & washbasin, two further double bedrooms, one with fitted wardrobes, further good size single bedroom. Family bathroom with 3 piece white suite with shower over the bath. Externally with enclosed rear garden with large decked patio area & shed for storage. No pets, no smoking. .